Lots of cyclical ketogenic resources to help show you how to do a keto carb up, why it may be a game changer, and take your keto awesomeness to the next level! Carbs are not all bad (*gasp*). However, eating too many carbs can cause a plethora of problems, from blood sugar spikes to digestion problems. You probably already know this… and you know it’s not fun. Carb ups (also known as cyclical ketosis), a strategy one can practice on a ketogenic diet, are when you eat more carbs, on a ketogenic diet. And, there are specific strategies to doing this right while doing keto. By adding a carb up practice to your keto diet, you have the potential to encourage your body to heal, overcome plateaus, balance hormones, and more. Okay, let’s start with the basics of carbing up with keto. The hardest part is usually just figuring out how to get started. Once you get past that, you’re golden. Everyone is different so it’s good to arm yourself with enough information to know if carbing up on a keto diet is something that’s right for you. Plateauing with weight loss on keto? Need to balance out your hormones? There are several signs that you might need a carb up, and this video will explain those signs so you can be prepared. Watch this video to learn if carb ups are right for you! In this video, I give you 10 examples of what a carb up looks like (with pictures), how I carb up and why you should, too. 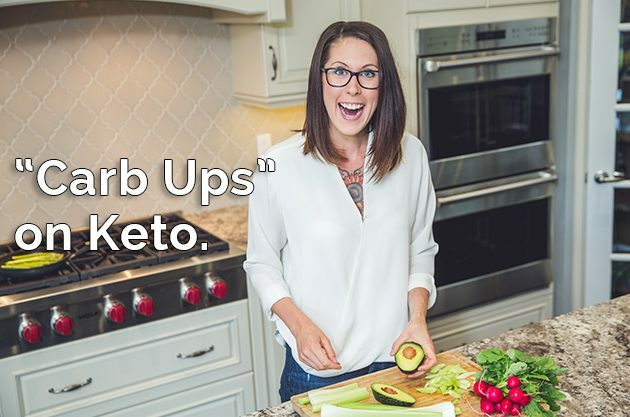 I also explain what a carb up is and who might benefit from carb ups, so whether you’re just starting to try carb ups with keto, or you’re a seasoned keto veteran and would just like some more ideas, this is a great resource for you! What is a keto carb up? Video: Our Fat Fueled Plates – Doing A Carb Up On Keto! On this recorded Periscope video, I show you around my kitchen and give you a personal example of a carb up that I made for myself. Why are carb ups important in keto? If you’ve ever wanted to just follow me around and see the keto meals I eat, I figured out how to let you do that without all the travel expenses and the creepy factor. Basically, I recorded myself anytime I prepared any keto meals for the entire day with a glorious “carb up” at night. In this video, I show you the essentials for your first keto carb-up, including when and how often you should do a carb-up, how many carbs, and what type of carbs you should get. If you’re finding yourself stuck, if your hormones are still a bit out of whack, or if you’re just not feeling up-to-par, this video will deliver the lowdown for your first keto carb-up. Plans for keto breakfast, lunch, dinner, and even snacks! Every week, you’ll receive a weekly guide made with lots of love via email to help you reach your keto success without having to stress! 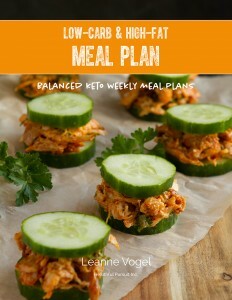 It includes absolutely everything you need to know to successfully follow a low-carb, high-fat diet – from what to shop for and how to prepare meals to how to stay on track, motivated, and moving forward, no matter how busy you are! Stop stressing about planning, and start enjoying your fat fueled life! In this episode of The Keto Diet podcast, I interview Maritza Ahn about her firsthand experience developing a carb up practice. From what she eats on a carb up, the fears she had to overcome in order to move forward with her carb ups, the failures she’s had while developing the practice, signs that point to having too many carbs on a cyclical ketogenic practice, her ketone numbers after a carb up, and more. 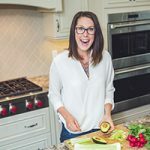 In this episode of The Keto Diet podcast, I’m going solo to chat about how the ketogenic diet is different for women and how to navigate a keto world where results and suggestions are primarily focused on the results of men. In this keto podcast, we answer your questions on whether egg fasts are safe, what foods to use in a carb up, and how to navigate fiber on keto. Carbing up can be really helpful, but not all carbs are created equal! Listen to this podcast to learn about how to choose your carb up foods. Many people have been doing the whole keto thing without incorporating carb ups. So if you’re one of those who are interested in trying it out (I totally recommend at least trying), check this podcast out to learn how to start incorporating carb ups in your ketogenic diet. There you have it… tons of keto resources all about carb ups in the ketogenic diet! If you found this information helpful to you or you still have questions, check out past keto question and answer sessions.